Fractures of the talus usually require a significant mechanism such as extreme dorsiflexion or a fall from a great height. 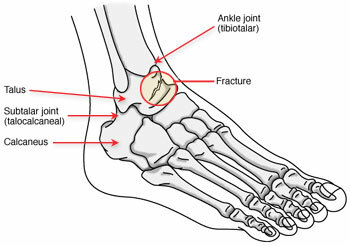 Multiple areas of the talus can be fractured. In the case of a dome fracture, there may be an obvious fracture line, but more commonly, an osteochondral injury will be hard to visualize on plain radiographs. Major fractures, including talar neck and head fractures, may be considered surgical emergencies and therefore require immediate orthopedic consultation. A high rate of avascular necrosis can occur with such injuries.